Once upon a time, there was a man called The Roman Empire who ruled over all the Mediterranean. Then he died, leaving his grandson Italy in his place. Despite the riches and talents he inherited, Italy was weak, and was a target for all his neighbors. He finds Italy hiding in a tomato crate. Poor Italy is scared and has no idea what the hell is going on, so Germany takes him under his wing, where he remains until World War II. At the same time, the "Allied Forces" are getting ready to counter attack... if they can reach an agreement, that is. A popular Japanese series by Hidekaz Himaruya that is an allegorical tale of the history of the world, especially during World War II, with anthropomorphizations of different countries and the various stereotypes associated with them. Axis Powers Hetalia is at once educational, irreverently silly, occasionally touching, and quite probably very offensive to certain people. Surprisingly, it gets many of the more subtle and less well known relationships between European countries rather well-represented, which you usually wouldn't expect of foreign writers. The word Hetalia is a portmanteau of hetare and Italia (Italy), which means hopeless Italy, as Germany soon discovers. Hopeless in a cute way. You know, with the Axis powers, it's not bad to be bad at being bad. 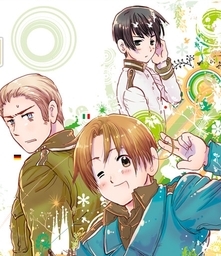 Starting off as a webcomic in 2006, Hetalia garnered a strong fan following, and was eventually published in print form two years later. The original webcomic can still be read here, with scanlations located here. note Following a Cease and Desist notice from Gentosha, the published manga volume material is no longer available, although scans from Comic Birz and Himaruya's blogs are unaffected. Himaruya also has two blogs - one here and the other here . Ten manga volumes have been printed in Japan, the latest in June 2017. Monthly episodes also ran in Birz magazine for about a year starting in 2011, and those stories were reprinted in volumes five and six of the published manga. As of September 21, 2014, the series began a new bi-weekly manga serialization in the Shonen Jump Plus online magazine called World☆Stars, and manga volumes after volume 6 were released under this name. The English manga adaptation was originally licensed by Tokyopop and two volumes were released, but they went bankrupt before the third volume could be published. Right Stuf picked up the series and has volumes 1 - 6 for sale. A series of drama CDs were also made, followed by an anime adaptation, although broadcast on television was canceled in favor of alternate means. Produced by Studio DEEN, the anime began airing in January of 2009, and currently has completed six seasons, along with several additional "special episodes." The third and fourth season were released under the name Hetalia World Series, season five was titled Hetalia the Beautiful World, and season six titled Hetalia: The World Twinkle. A movie, Paint It, White, has been released in Japan and became available in North America in November 2011. Both the anime series and the movie have been licensed by Funimation. The extra episodes included on the Japanese fan discs are included on the fourth season DVDs, but are not available online. Because of this, any casual fan watching streamed episodes online might get confused when they see the episode in season four where teenage Prussia sees Hungary's breasts and is reminded that she is female, as the episode where he discovered her gender was one of the extra episodes for the third season. Most of the anime can be viewed for free at Funimation's website. note Although you need to have an account on their site and be in the US or Canada as they are region blocked. The full series, including both the subbed and dubbed anime, the movie, and extras such as commentary and bloopers, are available to people who have a paid subscription. Hulu also has both subtitled and dubbed versions of the Axis Powers, as does Funimation's YouTube Channel. Likewise, a sub of World Series is also officially available on YouTube and Hulu . The show is TV-MA, so an account on either is required. The franchise also acquired a stage adaptation, beginning in 2015 and running for three years (with plays Singin' in the World, The Great World, and in the new world) until the final installment, A World in the Universe, came in 2018. Please note that the dub takes a great number of liberties with the script. Now has its own Fan Works, Alternative Character Interpretation, Memetic Mutation, Hetalia Bloodbath 2010, Hetaween 2011, Hetalia Bloodbath 2011, Hetalia Hetaween 2013, Ship Tease, Ho Yay, Ron The Death Eater, Ships That Pass In The Night, Ship To Ship Combat, Die For Our Ship, and Fandom Specific Plot, pages. Compare Scandinavia and the World, another webcomic that was inspired when a Danish artist felt that the Scandinavian nations didn't match up with the stereotypes that she was familiar with, Afganisu-tan, a short lived webcomic centered around a humanized version of Afghanistan, and Planetary Moe, which has been described as "Hetalia but with astronomical bodies instead of countries." Also compare Mobile Fighter G Gundam, which foreshadows the theme of National Stereotypes to the point that it's sometimes seen as a spiritual predecessor. Also compare the much more amateurish (deliberately so) Polandball comics, which also features anthropomorphizing nations. See also World Flags , an official project for the Tokyo 2020 Summer Olympic Games where flags of various nations are depicted as pretty boys in tradional Japanese clothing. By the way, there are two Italies (Veneziano and Romano), but assume we mean Veneziano (North Italy). Similarly, "Korea" refers to South Korea, as in the original comics he is called by the Japanese name for South Korea (Kankoku) and the North (Chousen) is never shown.